Although all effects should be added through the Network view, there are two effects that can be quickly added through the Timeline view. These effects, Colour Card and Quadmap, can also be added through the Network view in the usual manner. In addition, there is a special way of grouping elements that can only be done through the Timeline view. 1. In the Timeline view, click on the Add Layers button and from the Layers drop-down menu select the desired effect that you would like to add. 2. The effect appears in the Timeline view. The Colour-Card does not require to be parented to any layer. 3. 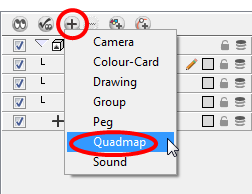 For the Quadmap, drag the drawing layer onto the Quadmap layer to parent it. 4. In the Timeline view, double-click on the Quadmap layer to open the Layer Properties view. 5. In the Layer Properties view, adjust the parameters. Once you have set the parameters for your effect, you can store it in the Library view as a template so you can quickly reuse it later on without having to set the parameters again. Refer to Creating a Template to learn more about creating templates. There are several advantages to using the Group Selection With Composite command (only found through the Timeline view) over the simple Group Selection (which references both the Group layer in the Timeline view and the Group module in the Network view. One of the advantages that this command has is that it groups all the selected elements into a neat module that has a nested composite. This means that there is only one connection coming out of the Group module. With the simple Group module or command, the Group displays the same number of connections as elements in the group. Both grouping commands display the same structure in the Timeline view. 3. The layers appear indented under a new Group layer in the Timeline view and in a new Group module in the Network view.